The solution I proposed innovates at the intersection of stress, communication, comprehension, and adherence. Research has shown physicians who increase demonstrated empathy and understanding through encouraging speech can also increase patient recall and decrease patient anxiety. 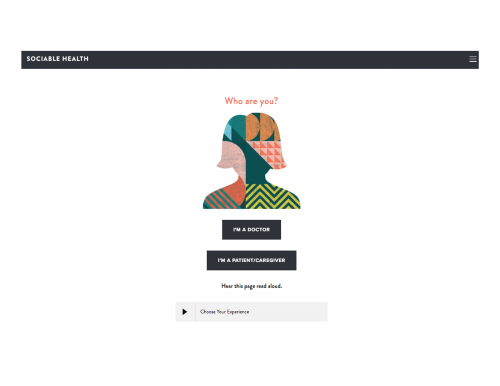 I created “Sociable Health,” a digital experience and related clinical protocol designed to empower patients/caregivers and educate healthcare providers. The patient experience provides encouragement, while the provider experience aggregates some of the most innovative communication strategies shared by other doctors and researchers. The patient/caregiver and provider lessons are distilled into bite-sized nuggets that could be reviewed over morning coffee or between appointments. The clinical protocol begins by leveraging the 19 minutes patients wait, on average, to see a doctor. At check-in, a patient is given the Quick Check card. The card can be completed in as few as 2 minutes. The patient is asked to bring it back to the desk when finished. The card is added to the file with other materials the doctor will review during the visit. 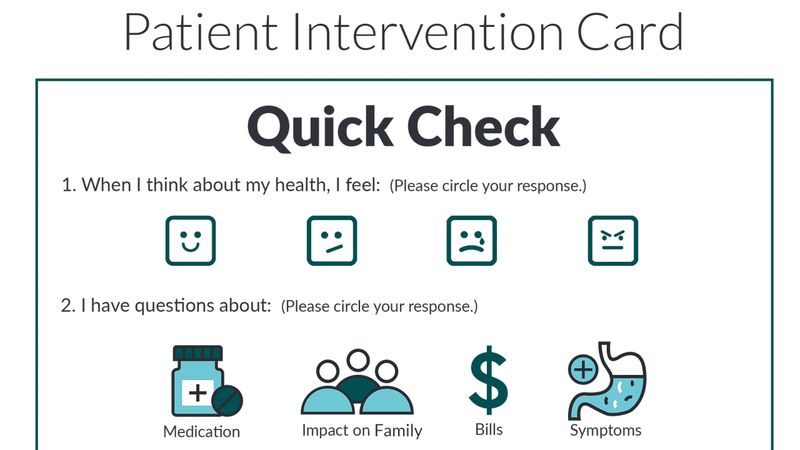 It can be intimidating for patients and caregivers to communicate health concerns during an appointment, especially when anxious or uncertain. 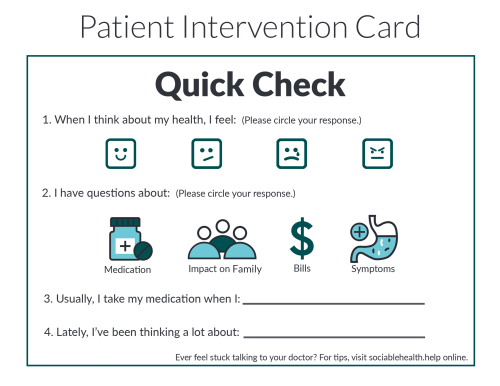 The Quick Check card gives patients, caregivers, and doctors a common structure to kick-start the conversation. Before leaving the patient to wait for the doctor’s arrival, the nurse presents an iPad with the Sociable Health digital experience open. The patient is asked to read or listen to the lessons while waiting for the doctor. After the visit, the patient is given a Reminder Card to finish the exercises at home. The day after the appointment, the patient is sent a reminder email. 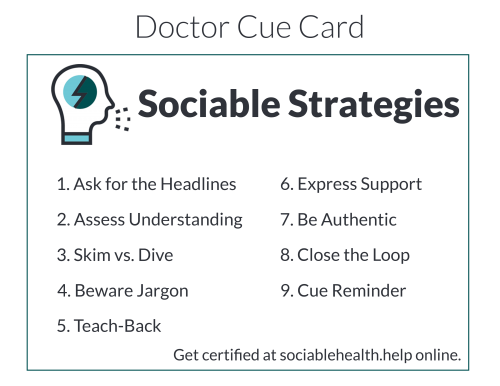 Sociable Health provides a framework that builds confidence in patients and caregivers, while encouraging empathy in physicians. This creates the foundation for more effective communication. If submitted to, and approved by, the Accreditation Council for Continuing Medical Education (ACCME), the communication training offered by Sociable Health could count toward medical continuing education credits for providers.